The newest addition to the gallery range of stoves is the Classic 5 Cleanburn Stove. This stove is suitable to burn wood or smokeless coal in smoke controlled zones. It's a small stove but with an impressive large viewing window. As with all the Gallery range of stoves this is a great stove at a great price. 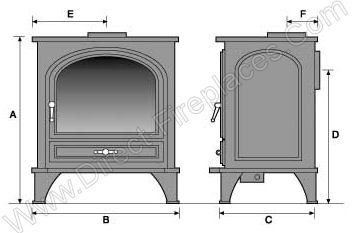 In the photograph the door handle for the burner is on the right hand side, but in the dimensions diagram it is on the left – is there an option for it to be on either side, or is the diagram a generic one (and wrong)? The line drawing used for the dimensions are simply there for reference so you ca see which is the height, width depth etc. The stove comes as it is in the photograph. Apologies. I could ask this question for every stove. What is defined as combustibles? Is the stone wall at the back of a hearth OK or is this combustible? If there is a mantelpiece is this considered combustible? I know it sounds obvious but just want to check. Thank you. It's not always obvious, a lot of things are considered combustible. The stone wall inside the fireplace chamber should be non-combustible as should the hearth. A 'fake' chimney breast made of stud wall and plasterboard would be considered combustible. I have a 6in flue liner in now I noticed it say 5in flue liner with Firefox 5 burner.can I continue to use my 6in flue liner? It’s perfectly ok to use a stove with a 5 inch flue on a 6 inch flue liner. You just need an increasing adapter. We can supply that as well if you need it. Please feel free to contact us if you have any further questions or if you wish to place the order over the phone. What size is the glass viewing window? The height of the viewing window is 200mm and the width is 230mm. and best of all a 10 year warranty. It's a great little stove and fantastic value for money. As the Gallery Classic 5 stove has a 5-inch flue outlet and is being used in a Defra smoke control area you may use a 5-inch liner. On your Firefox 5 Clean Burn 2 what flue should I allow for - about 6m in total - and how much is it? We would recommend you have the property surveyed by a Hetas registered installer before purchasing any stoves or liner. They will be able to tell you if you need a chimney liner and how much you will need. Our liner packs can be purchased from the dropdown options when ordering your stove. The liner pack contains the requested length of 316 grade stainless steel liner along with an adapter to fit the stove pipe and a raincap that fits in the top of the chimney pot. I can confirm that the Gallery Classic 5 Stove is CE approved. It is Defra approved to burn wood in smoke control areas. I am considering installing a multifuel stove, my only concern is that I will have to install the flue system through a 13" external cavity wall. What are the full dimensions of the 125mm dura flue 135 degree prolonged tee piece and is it a twin wall system? The 125mm 135 prolonged tee piece is twin wall. The length of the "diagonal" is 782mm (30 13/16 inches). I have sent you our flue design sheet which shows 4 common options for fitting twin wall. If you pick the one that best suits your needs and fill in all the dimensions, our stove team can compile a full shopping list for you. Installation guide and user instructions for Gallery Classic 5 multifuel Defra stove.